Barcelona's final-day title showdown with Atletico Madrid will be a "unique match", says Barca defender Adriano. Atletico lead La Liga by three points but Barca have a better head-to-head record so will win the title with a victory at the Nou Camp on Saturday. "We wanted to win but the draw allows us to play the decider at home," said Adriano after drawing 0-0 at Elche. "It will be a unique match, we have to focus solely on this game against Atletico. We can't hold anything back." The Brazilian added: "It will be a match full of nerves and anxiety, but we have to control our emotions - we will have a very tough rival in front of us. We have to chance to win a very important title." Nine days ago Barca looked out of the title race, sitting three points behind Atletico, who had a game in hand. But a defeat for the Madrid side let the champions back into the title race. Atletico would have won the title on Sunday with a win over Malaga but, playing at the same time as Barca, they could also only manage a draw to set up Saturday's decider. Barca right-back Dani Alves added: "Everything has happened to us this season, but we have another chance to win La Liga. Now we have to focus on Atletico. "If we truly deserve the title, we have to prove it against Atletico, we have a chance to win La Liga. We have to give everything we have." 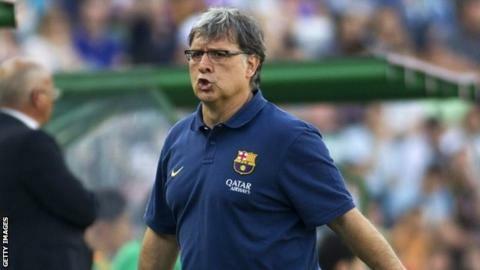 Coach Gerardo Martino is expected to be replaced this summer after one season in charge, even though they are now title favourites. "We hope to have the support from the fans for the remaining 90 minutes of the season; with the help of our people we can win the title," he said. Barcelona drew 0-0 on Sunday away to Elche, where a defeat would have crowned Atletico champions. "In the final minutes there was ambiguity in our approach because we needed to score but a goal from Elche would have seen us out of the competition. We tried until the end regardless of the results from the other matches," the Argentine said. "This situation has happened to us before this season, when we miss early chances our patience runs out and it turns into desperation."